i woke up this morning and my neck hurt like hell. i think it has something to do with the GM bankruptcy and how relatively sudden it seems. i know they were talking about it all last week, but it doesn’t seem that long ago people were sort of freaking out that toyota’s global sales topped GM’s (1/21/09, to be exact). things weren’t rosy, but they weren’t banner-headline terrible. sure it’s corporate mumbo jumbo, but it’s still a long way from slipping to #2 to where we are now. i’m also suffering from severe number fatigue. 3,000 white-collar workers, 2,100 dealerships, 21,000 hourly workers. gah. i know i’m going to business school and should love numbers and stuff, but i’m waiting for an episode of this american life to bring it all together. are you still concerned about the immense flow of illegal immigrants from mexico, et al? For the first time in a generation, since officials began to tally accurate records, the Mexican government reports a dramatic, sustained decline in the number of Mexican migrants going to the United States. The most recent count found that 186,000 fewer Mexicans left for other countries in 2008, compared with the previous year, a precipitous 22 percent drop, according to the National Institute of Statistics and Geography. and here i thought the solution would be to help mexico. much easier has been to destroy the US economy. this is my fave. at first i wondered why they had a sad pic of a street. then i noticed all home foundations that had been built, but nothing else. 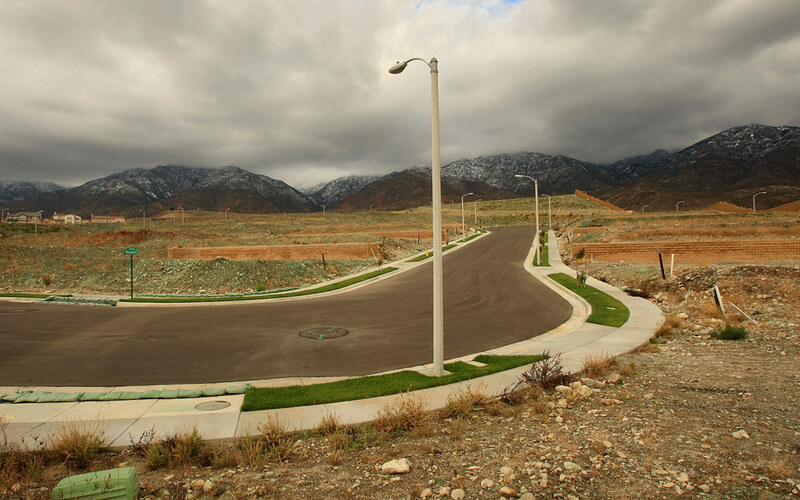 pic is of rancho cucamonga, california, about 40 miles inland from LA. a job fair in china. i’m not saying i know how to fix journalism, but this is something that has bothered me about the conclusion that journalism absolutely cannot survive on online advertising alone. true online ad rates are much lower than print rates right now, and true, they aren’t growing as fast as publications need them to. BUT did we forget we’re in the worst recession since the dawn of the internet? are people seriously drawing the conclusion that since online ad sales are horrific right now, it means they will be horrific forever? i just think it’s not the best time to make assumptions about the long-term viability of business models. just saying is all. still don’t understand the credit crisis? i almost feel bad about posting my “detroit is in a freefall” slideshow after linking to that time.com one, but i took the pics and they’re too pathetic (all possible meanings of this word) not to show. they’re all from birmingham, the generally upscale part of oakland county. “for lease” was the theme of the weekend. bah. these 5 pics are probably only even mildly interesting to you if you’ve been to birmingham. otherwise, you can move on. subprime loans are getting a bad rap, and it’s unfortunate b/c when doled out correctly, they can do a lot of good. in many ways, a good credit score is a number that can be gamed, and consequently it can be hurt even if you’re responsible but not necessarily knowledgeable. an excellent credit score is just a shorthand way for banks to know that you’re responsible. but if you have a low score, it doesn’t necessarily mean you’re a bad money person. it just means you might not have known how to work the credit score game–a situation that tends to afflict minorities and immigrants. banks can responsibly loan to low-scoring customers; it just takes a little more legwork. anyways, here’s an excellent defense of subprime loans. basically what it says is that ethical subprime lenders — those who weren’t using loans to sell up to wall street — have low default and foreclosure rates AND they still make money (and continue to make money, even as everything else tanks). This line of reasoning is absurd for several reasons. Many of the biggest subprime lenders weren’t banks and thus weren’t covered by the CRA. Nobody forced Bear Stearns to borrow $33 for every $1 of assets it had, and Fannie Mae and Freddie Mac didn’t coerce highly compensated CEOs into rolling out no-money-down, exploding adjustable-rate mortgages. Banks will lose just as much money lending to really rich white guys like former Lehman Bros. CEO Richard Fuld as they will lending to poor people of color in the South Bronx. But the best refutation may come from Douglas Bystry, president and CEO of Clearinghouse CDFI (community-development financial institution). Since 2003, this for-profit firm based in Orange County—home to busted subprime behemoths such as Ameriquest—has issued $220 million worth of mortgages in the Golden State’s subprime killing fields. More than 90 percent of its home loans have gone to first-time buyers, about half of whom are minorities. Out of 770 single-family loans it has made, how many foreclosures have there been? “As far as we know,” says Bystry, “seven.” Last year Clearinghouse reported a $1.4 million pretax profit. Community-development banks, credit unions, and other CDFIs—a mixture of faith-based and secular, for-profit and not-for-profit organizations—constitute what might be called the “ethical subprime lending” industry. Even amid the worst housing crisis since the 1930s, many of these institutions sport healthy payback rates. They haven’t bankrupted their customers or their shareholders. Nor have they rushed to Washington begging for bailouts. Their numbers include tiny startups and veterans such as Chicago’s ShoreBank, founded in 1973, which now has $2.3 billion in assets, 418 employees, and branches in Detroit and Cleveland. Cliff Rosenthal, CEO of the National Federation of Community Development Credit Unions, notes that for his organization’s 200 members, which serve predominantly low-income communities, “delinquent loans are about 3.1 percent of assets.” In the second quarter, by contrast, the national delinquency rate on subprime loans was 18.7 percent. surprise! poor people and minorities can be responsible home owners and money managers. it just helps when banks realize that their interests are actually aligned with their customers’ (which has definitely not been the case in the past 20 years or so). it also helps when brokers don’t lie and take advantage of people who turn to the financial sector for assistance. in this version of the classic thriller, kevin spacey buys an oversize house in las vegas, while an aged brad pitt looked at his 401k yesterday and had dinner with richard fuld.